2015.09.06 Don't Pull The Wool Over My Eyes—Baaaaa! Meet a very famous sheep—lost in the wild and woolly outback of Australia, or somewhere, suffering from toxic obesity, and answering to the name of Chris. He’s lost in his face, a dyed in the wool introvert about to be totally blinded by all the wool over his eyes. Have to admit I laughed out loud! Usually sheep follow and graze and aren’t very interesting, though some are irritating as hell, butting and shoving—not just the rams! But Chris is a celebrity. He was lost and now he’s found—like the biblical parable of the lost sheep, the one for whom Jesus leaves the whole herd, the one who matters to God no matter how fat, lonely, ugly and hermitic it is. Lore has it that Chris hid in a cave for years, avoiding the inevitable first haircut. Many kids screech like hell when they get their first haircuts. You’d think the barber was going to cut off their heads. But hair is so symbolic—of strength for the biblical Samson, of beauty for everywoman, of salvation for Rapunzel, of ethnic distinction in some cultures, and of solidarity for those who shave their heads to accompany someone who has lost their own hair to chemotherapy treatment for cancer. 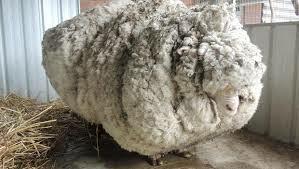 Chris, when finally found and shorn, offered a wool yield of 89 lbs. 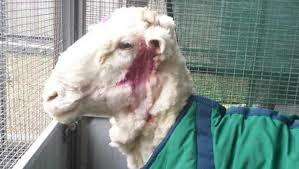 The Guiness Book of World Records reports that the largest yield of shorn sheep’s wool was 63lbs and 11 ozs. Chris tops the record. Will he stay humble? He probably will, but since his wool is the equivalent of 30 sweaters, I bet retailers won’t. Think of the many great Christmas gifts that will come out of this, and will be famous to boot. Retail stores will grapple for Chris sweaters, and they will become a brand—genuine or not. Chris mittens, caps, Chris miniskirts! But now that Chris has been found, and the shears have saved him from the latest and greatest obesity clinic, he has come out of the anesthesia used for the massive shearing operation, he wants to see what he’s missed. Here he is shorn, nearly unrecognizable, curious, awakened, and out from under his load—shy but lighter. Welcome to the world of sheep, Chris! No more wool will be pulled over your eyes. I bet if Jesus had found Chris he would have introduced himself and then, with the sheep’s permission, taken a nap on the luscious woolly pile—all before he asked: You wanna go home? In another woolly story, the Episcopal Church's 2015 General Convention passed a resolution calling for a renewed effort to end racism in the name of the Gospel of Christ. Sunday, September 9, was set aside to focus on this theme: "Confession, Repentance and Commitment to End Racism." -I preached in an all-black church in Boston the end of August. My husband and I had been at this church two years ago and he had preached. Some of the women had said: "Next time they come, we want to hear from the woman!" I, "the woman", was nervous. They were friendly and caring enough to provide me a sturdy stool to stand on as I went into the pulpit. (Most pulpits were designed for tall men!) I looked out at the congregation and my first thought was irrational: "Where are all the white people?" Yet suddenly.......... I knew what white privilege meant. -At Boston College in July I heard a fine scholarly lecture on the falsely maligned biblical woman, Mary Magdalene. At the Q and A time, a woman stood up to witness. She said something like this: "I'm a woman! I'm black! I'm tired of hearing people say: first we'll work on racism and then we'll tackle sexism. I'm black and I'm a woman. I'm BOTH! We need to work on both. NOW!" She sat down to applause. We, in church and society, have pulled the wool over our own eyes and ears—also minds, hearts and souls. If we pay attention, and count on lots of grit and grace, we can get shorn. Oh, it will hurt, as much as it hurt Chris. Our "anesthesia" will be working together in a context of prayer and honest conversations—blacks with whites, men with women, mansioned with homeless, able with disabled. As we listen deeply, the wool will fall from our eyes and ears. We will see and hear the truth, and from there wonderful things can happen.